It used to be a little talked about secret but the fact that all Netflix users aren’t treated equally is now well and truly out of the bag. Due to licensing deals with content providers, most regions in the world are granted access to differing levels of content. Users in the United States get the best deal from a choice perspective while subscribers in many other regions are offered much more shallow libraries. However, for many years determined subscribers from all over the world have been using various tricks to gain access to the forbidden fruits of the U.S. Netflix library. This has largely been achieved through the use of VPNs and proxies, techniques which worked almost flawlessly until complaints from rightsholders forced Netflix into a crackdown earlier this year. Nevertheless, other methods to circumvent Netflix blocks do exist. Some savvy individuals have been using something known as a tunnel broker, an online service which provides the user with a network tunnel. One particular type, known as an IPv6 tunnel broker, provides users with a modern IPv6 tunnel to sites via the much older (but massively more prevalent) IPv4 protocol. One such service is provided free of charge by Hurricane Electric, the operator of the world’s largest IPv6 transit network. Called simply ‘IPv6 Tunnel Broker‘, the company describes the service as follows. “Our free tunnel broker service enables you to reach the IPv6 Internet by tunneling over existing IPv4 connections from your IPv6 enabled host or router to one of our IPv6 routers. Our tunnel service is oriented towards developers and experimenters that want a stable tunnel platform,” Hurricane explains. With noble goals at heart, this service is clearly not designed to give Netflix headaches. However, with tunnel endpoints in the United States that was apparently the net result, with people using the service able to access titles geo-restricted to the U.S. Somehow this situation came to Netflix’s attention and during the past few days the company decided to take action. Numerous reports indicate that Netflix has now blocked users of Hurricane Electric’s tunnel broker from accessing its services, regardless of their intent. They now receive the message below. A Reddit user called KeiroD contacted Netflix after receiving an identical message with the same error code – M7111-1331-5059. From the transcript of the discussion its clear that KeiroD already had a good idea why he was blocked. “The only thing that I can think of that would affect us would be using the Hurricane Electric tunnelbroker but we’re US-based as is Hurricane Electric’s tunnel,” he explained. Netflix responded as expected. “Yes it is possible as they work the same as the VPN or proxies. There is a way to find out if that is the reason, do you have a way to turn it off for a moment so we can try the service again?” customer support asked. In response KeiroD turned off IPv6 in his router’s tunnel broker setup, rebooted, and played a random movie successfully. General blocking aside, the sad part here is that KeiroD is based in the United States, so already had access to U.S. content on Netflix. The fact that his account with Netflix was registered in the United States and his endpoint was in Kansas City didn’t help at all. Interestingly, the topic is also under discussion in Hurricane Electric’s forums. 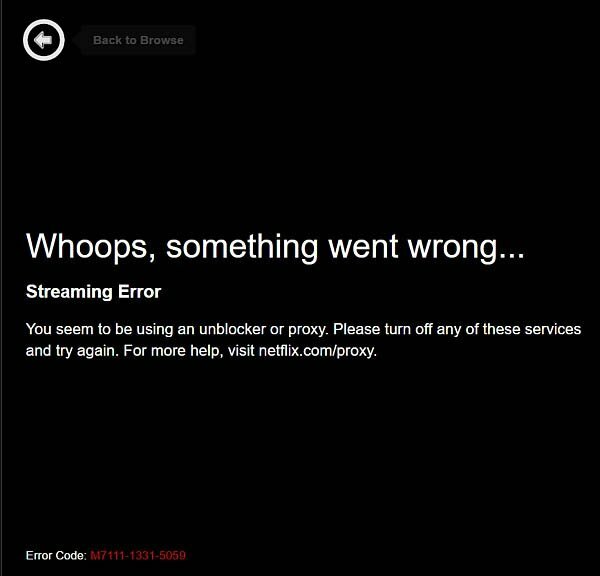 After years of people questioning whether he had access to the U.S. version of Netflix, a Canadian user there reported that his Netflix suddenly stopped working a few days ago. “Turns out that I did [have the U.S. Netflix] and didn’t even know it! Now Netflix is blocking me, and after a long while I finally figured out that it was because of my IPv6 tunnel. The thing is though, I am in Canada, and I use the tunnel server in Toronto, also in Canada, but Netflix detects my connections as coming from the US!” he explains. Sadly, however, Hurricane say they can’t help. “Our [subnet] is registered as part of a US company, and that is the address space being used there. We do not have any IPv6 allocations allocated and designated as ‘Canada’,” a senior Hurricane engineer responded. As an avid supporter of IPv6, Netflix’s decision to block Hurricane users is somewhat disappointing, especially when they have U.S. accounts and are also based in the U.S. Understandably the company is responding to pressure from rightsholders but interestingly there’s no change in the current situation even when they aren’t a factor. Netflix previously indicated it wanted to improve licensing issues by creating its own shows, shows that can be accessed anywhere in the world without issues. But even they are off-limits, it seems. “This started happening to me this afternoon. Called Netflix support, and based on that conversation I concluded they consider Tunnelbroker a VPN/Proxy,” another user on HE’s forums explains. And so the whac-a-mole continues….